NOTE: Do NOT connect this switch to ceiling fans, motors, or home appliances. Use with lighting only. Manual Operation:Click the toggle up to turn on the light to the last brightness level. It takes around 3 seconds for the dimmer to reach full brightness. The ramp rate is not adjustable.Click the toggle down to turn off the light (with a fade-out effect and 3-second ramp rate).Press and hold the toggle up to add more brightness. Press and hold it down to reduce brightness.After power failure, the switch will automatically turn on to the last brightness level.In a 3-way installation, the slave (mechanical switch) can only turn the light on or off. The slave switch will always turn the light on only to the last brightness level. 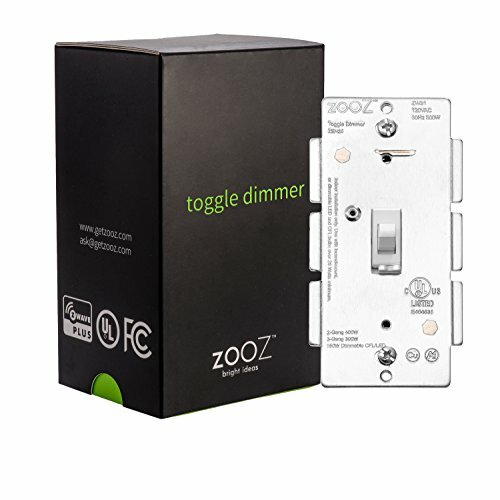 Dimming is only available from the master Zooz switch and your Z-Wave software.